BACK TO THE FRONT PAGE BASIC INFO. 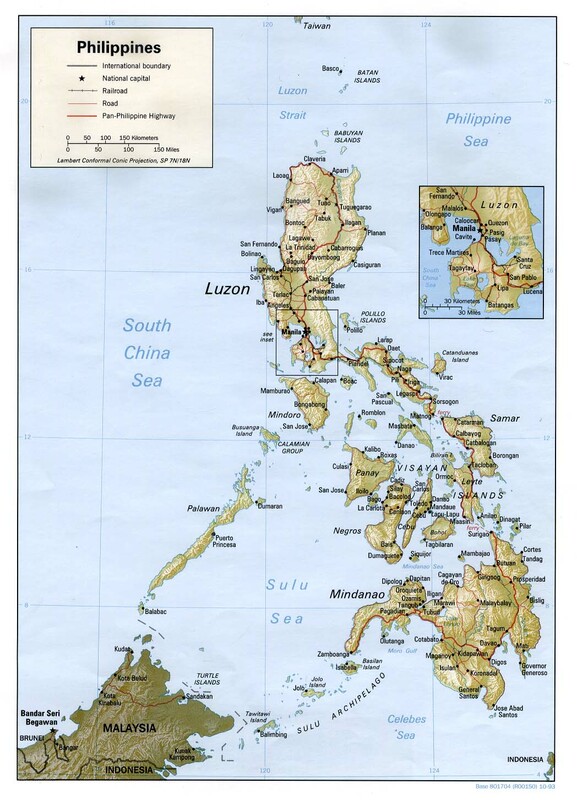 ECONOMY GEOGRAPHY ... PEOPLE Color PHILIPPINES The Philippines are islands located inSoutheastern Asia. They form an archipelago between the Philippine Sea and the South China Sea, east of Vietnam. The terrain of the Philippines is mostly mountains with narrow to extensive coastal lowlands. When Magellan came upon the island of Homonhon in 1521, he claimed these islands in the name of King Philip II of Spain. The islands where then named `Felipinas,' the Philippines. Little did they know then the treasures of those yet unexplored isles, a bounty of verdant mountains rich with gold and ore, of emerald islands ringed with meandering beaches, of forests alive with wondrous flora and fauna, of fertile lands, spectacular sunsets and temperate climes which have bred a warm, smiling people who would be known the world over for their overwhelming hospitality. Rain forests cover the slopes of many Philippine mountains and some lowland areas. Sunlight, warmth, rain, and fertile soil causes many trees in these forests to grow 150 feet tall, creating a leafy canopy. Beneath the shade of the treetops thrive vines, epiphytes (air plants), and climbing palms. Pine forests are common at higher elevations. Stands of Philippine mahogany, banyan (part of the mulberry family), and molave (a tree with a hard, yellow wood) can also be found on the archipelago.